With his hair perfectly coiffed and a red Los Angeles Angels uniform having replaced his suit jacket, the most sought-after player of the offseason began his highly anticipated MLB career with six simple words. “Hi. 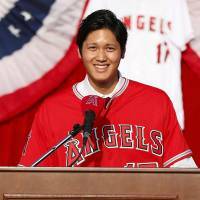 My name is Shohei Ohtani,” he said with a smile playing out across his boyish features. The end of the whirlwind “Otani sweepstakes” didn’t bring closure, only more anticipation. Angels fans can’t wait to see him playing for their team. Deep down, even fans of teams who missed out on the two-way star have to be wondering what’s in store now that he’s in MLB. 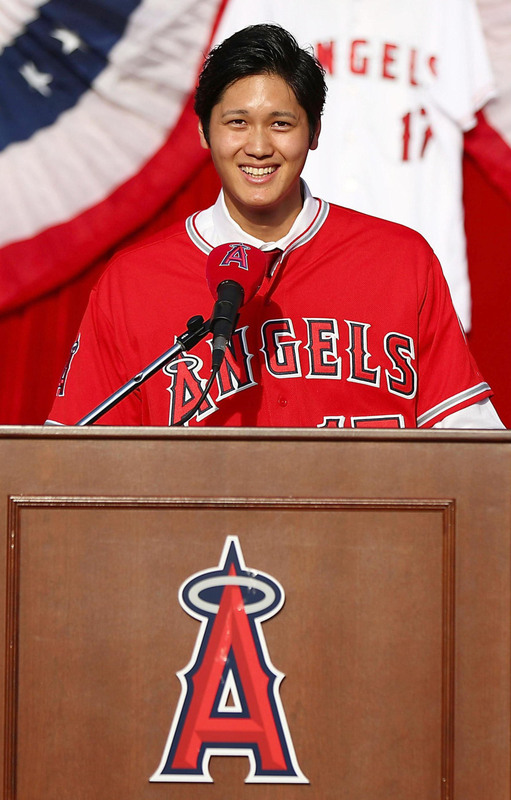 Ohtani owned his introductory news conference Saturday, thanking many, flashing that smile often and even joking about wanting to wear No. 27, which belongs to Angels outfielder Mike Trout, Los Angeles’ two-time AL MVP and arguably the best player in the major leagues, before deciding on No. 17. Ohtani’s cheerful, youthful countenance hides a fierce competitor whose skills on the mound and at the plate could change baseball. His goal is to be a regular two-way star, the first the majors will have seen in many decades, and the Angels are going to give him the chance. “We definitely plan on him being a two-way player, there’s no doubt about that,” Angels manager Mike Scioscia said to applause during the news conference. As much as many baseball people like to stick to the tried and true, it’s revolutionary enough the Angels are going to let Ohtani try his hand as a two-way player. General manager Billy Eppler even said the team would look into a six-man rotation with that in mind. Fans will be watching closely, but so too will scouts and executives. If Ohtani succeeds in the end, and especially if he’s a vital piece of a championship contender, you can bet the other teams will take notice. It would be a game-changer that could, several years down the line, see more two-way players, six-man rotations or other outside-the-box strategies in MLB. At the lower levels it would show other star athletes the two-way route is possible, and in the same vein perhaps even change the way teams scout superior athletic talents. After all, Ohtani probably isn’t the first to come along with the requisite ability. He may just have been the first in decades to have landed with a pro team, the Hokkaido Nippon Ham Fighters in the 2012 draft, willing to eschew the traditional thinking and provide the opportunity. Now he’s taking the grand experiment on the road. Otani was 42-15 with a 2.52 ERA on the mound for the Fighters while hitting .286 with 70 doubles and 48 home runs. He also played in the outfield early in his career. Before his ichi-gun pitching debut during his rookie year in 2013, he on occasion pitched on the farm during the day and played outfield for the top team at night. So, he’s pretty good at multitasking. Fighters manager Hideki Kuriyama is giving his Angels counterpart Scioscia a stellar player but not a complete one. At 23, Ohtani is malleable, with a hunger for improvement and his prime years still ahead of him. “Development never stops,” Scioscia said. “As excited as we are to see his arm and the way it’s going to play on the mound, we’re as excited to see how his swing plays in the batter’s box. But there’s certainly a lot of work ahead of all of us. Japanese success is no definite precursor to MLB success. The majors have a deeper talent pool and there will be numerous adjustments to make on and off the field. Ohtani’s NPB years, however, have earned him a shot at least. During the news conference Saturday, Ohtani was asked about the attention he would play under and if he felt pressure. While the majors are a different stage, that ignores the spotlight he played under as one of the most watched athletes in all of Japan. He never withered under the spotlight, and it was good test for the years to come. Ohtani already has experience at being a two-way star and the attention it attracts. It’s only new to everyone else. It was new to many in Japan too, and there was no shortage of former players and commentators urging the young star to choose either pitching or hitting. But Ohtani maintained his resolve and proved them all wrong in NPB. If he does the same on his new stage, he might just change the game in the process.